What inspires you? 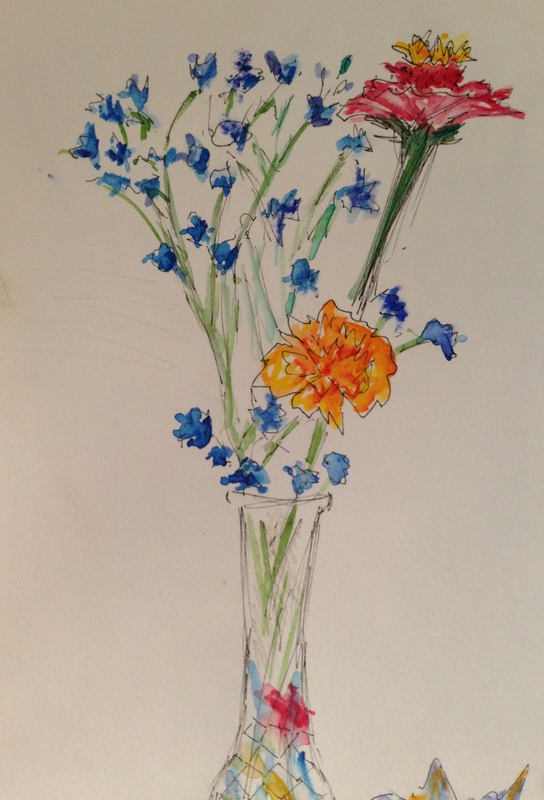 Lately, the flowers call to me to draw (and sometimes paint) them. This is from my art journal from the other night. I decided that the water in the vase should somewhat reflect the color of the flowers……yeah, I was pretty tired at that point. 🙂 The idea is cool though. Happy Tuesday, and may refreshing breezes and lots of light surround you today. Peace. Needed on a day like today! Amen and then some. Will be glad when fall chases the humidity away. Loose and beautiful! Have a great day Laura! Thank you, Lance; I appreciate your generous note. I hope you’re having a great week. Thanks Jill! I think it’s blue salvia with the marigold and a zinnia on the right. I should check with Hub to be sure tho. I take it back. I think it’s Chinese bluebell – the blue one. Very sweet. The water would definitely have reflections in it from anything surrounding the vase, so it looks fine! Lol thanks Rachel! I’m startling to wonder if abstract realism might be where I wind up. I just love color and can’t seem to resist adding it in lately, whether I would ever see that color there or not. (Not even sure if that’s what abstract realism is, but it’s starting to feel like me. Maybe whimsical realism? I don’t know. Thank you Laura for your lovely bouquet and greetings. Nice assortment of flowers, but he lines in your vase and the reflections are beautifully rendered. Like how loose and airy the painted flowers are. Very lovely Laura! People conversations new experiences stillness inspires me. Peace to you!